The Enough Project has long advocated for the appointment of a dedicated envoy to coordinate U.S. government policy toward the Great Lakes Region, and although not at the level of envoy, the appointment of special representative for the Great Lakes region, Ambassador R. Barrie Walkley, is a promising development for U.S. engagement in the region. The Enough Project’s grassroots activists and partners have long been dedicated to advocacy pressing the Obama administration to appoint a special envoy for this conflict-prone region. Over 24,000 people signed a petition urging President Obama and Secretary Clinton to appoint a Great Lakes envoy. We congratulate the success of our activists and urge those concerned about resolving the crisis in the Congo and areas affected by the LRA to continue to follow Ambassador Walkley’s tenure as special envoy. The special envoy will serve an important coordination role for the U.S. government in the Great Lakes. Prior to Walkley’s appointment, the issues covered by the special envoy fell to the portfolios of the staffers of several different deputy assistant secretaries of state, each juggling a wide variety of other responsibilities related to their regions and respective portfolios. His appointment moves Great Lakes issues from the diplomatic backburner to a place of prominence within the State Department. Ambassador Walkley is a lifelong diplomat with the U.S. State Department. In his most recent post as the consul general in Juba he was intimately involved in the lead-up to the referendum and subsequent independence of South Sudan. He began his career in Africa as a Peace Corps volunteer in Somalia from 1967 to 1969. He entered the Foreign Service in 1982 and served in posts in Yaounde, Cameroon, Lahore and Islamabad, Pakistan, Pretoria, South Africa, as well as Washington, D.C. In 1993, during Operation Restore Hope, he returned to Somalia with the United Nations to serve as the U.N. spokesman in Mogadishu. From 1998 to 2001, Walkley was the deputy chief of mission at the U.S. Embassy in Kinshasa. Following his stint in Congo, he held a series of ambassadorial posts on the continent, serving as the U.S. ambassador to Guinea from 2001 to 2004 and as the concurrent ambassador to Gabon and São Tomé and Príncipe from 2004 to 2007. He was Charge d’Affaires in Mauritius and the Seychelles between 2009 and 2010. 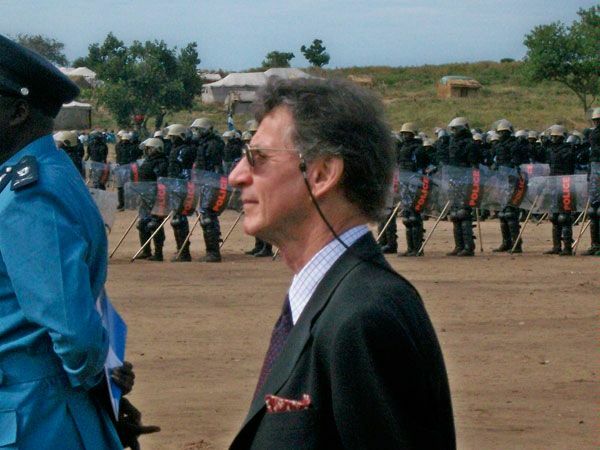 The appointment of a special envoy has been a cornerstone of the Enough Project’s policy agenda for the administration, in both LRA and Congo policy recommendations. In this position, Walkley will pull together the various elements of Congo and LRA-related U.S. government policy into a comprehensive strategy dealing with the region. Engage directly with regional leaders and prioritize respect for human rights, democratic process, and transparency: With recent election-related violence in Congo and repeated electoral irregularity in Congo, Rwanda, and Uganda in the past year, the relatively hands-off approach of the international community to electoral process abuse and fraud is cause for concern. In particular, there is an urgent need for sustained attention from high level diplomats who can engage directly with regional leaders to address issues of human rights violations, corruption, and abuse of power. Increase domestic and regional support for justice and security sector reform in the Congo. The issues of dysfunction, crime, and impunity within the Congolese security sector are perhaps the largest contributor to instability not only in Congo, but in the wider Great Lakes region. The special representative should be a leader in the formation of a unified donor policy aimed at creating agreement and coordination among Congolese security and judicial bodies as well as of those neighboring states that have historically acted as destabilizing agents in Congo—primarily Rwanda, Uganda, and Burundi—to establish greater regional peace through justice in eastern Congo. Push for the demilitarization of the mining sector and the full implementation of the Dodd-Frank Conflict Minerals Provision. While the Obama administration has taken a number of important and laudable steps to support traceability and livelihood diversification in the region, significant challenges remain in demilitarizing mine sites in eastern Congo and fully implementing the U.S. government’s conflict mineral strategy. The U.S. must continue to play a leadership role in the region to support peace and economic development, particularly in eastern Congo. Ensuring that high-level diplomatic and military cooperation with the government of Congo, neighboring states, and regional bodies such as the African Union and the ICGLR will be the lynchpin in securing the political buy-in for lasting reform in the region. Strengthen efforts to end the Lord's Resistance Army. The special representative should engage vigorously and regularly with regional leaders, the African Union, the United Nations, and other partners to improve efforts to end the LRA and implement the administration’s strategy released in November 2010. The increased coordination directed by Ambassador Walkley should bolster military operations to apprehend the LRA senior leadership; protect civilians; disarm, demobilize, and reintegrate LRA fighters; and conduct reconstruction and reconciliation initiatives. In particular, Ambassador Walkley should: ensure that the regional armies, which the recently deployed U.S. military advisors are assisting, have the necessary military, intelligence, and logistical support; engage vigorously with the governments in the region and the African Union to improve regional collaboration and coordination; and ensure that the newly authorized African Union initiative against the LRA is effective. The special representative should travel frequently to LRA-affected areas.